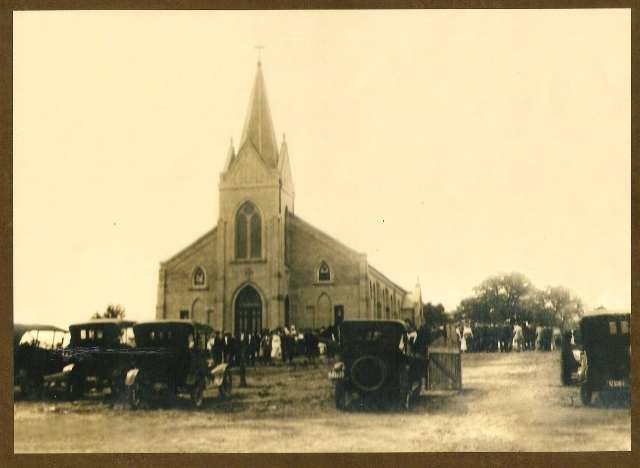 The catholic experience in Grimes County centered on the arrival of the early Polish settlers who made their homes on farms near the area of Anderson. The early Catholic community of Anderson was formed by these first immigrants who arrived in Grimes County. They came at the request of large land owners. Later, many came to join loved ones who had already made the journey, arriving from Poznan and Galicia. The story of the immigration of Poles to Grimes County begins in the 1860&apos;s. After the Civil War came to the largest wave of Polish immigration to the state of Texas. These immigrants settled primarily in East Central Texas in the late 1860&apos;s and this is where our interest and story begins. As the Polish communities in Texas continued to form and grow, the need for additional priests compelled the Bishop to turn to Europe in search for vocations and young priests willing to leave their native land and come to Texas. As a result of the efforts of the Bishop of Galveston during a visit to Paris in 1866, the Resurrectionists sent members of their order to Texas and the Bishop gave the Order the exclusive rights to all the Polish Parishes already in existence, as well as to any that might be created in the future. Father John B. Ballaclas was a young seminarian set to Hidalgo Bluff in Washington County to learn English before he was ordained there. Bishop Claude Dubuis ordained Ballaclas on New Year&apos;s Day in 1865. From his post in Hidalgo, he visited the surrounding Catholic communities including Anderson. He remained in the area until 1867. He was succeeded by Father Jean Louis Bussant who served in the area for a couple of years. After Father Bussant left, there was not a resident priest in the area (1869). Father Felix Orzechowski came to the United States in 1866 with the original group of Ressurectionists and was ordained the following year by Bishop Dubuis. In 1867 he was sent to what was then the wilderness of Walker County, serving the Catholic families he discovered in the New Waverly area. He was known as the Peregrinating Priest because of his travels and frugal way of life. He established a new parish in New Waverly in 1869. It was during this time that Father Orzechowski traveled on horseback once a month to minister to the faithful in the Grimes County area, offering Mass and the Sacraments in their homes. How long he traveled from New Waverly is not known for certain. He lived in New Waverly where church records were kept. In 1873 the 30 Catholic families concluded that a building was needed for the purpose of gathering for Mass. They purchased a school building and three and one-half acres of land located three-fourths of a mile south of Anderson. Father Orzechowski continued to travel once a month from New Waverly to serve the little flock of Anderson. He served in this capacity until 1882. At this time, Plantersville was attended from Anderson. During the time he served the Catholic community of Anderson, one hundred families arrived from Poland in 1880 and settled permanently in the surrounding area. Many of our family roots are traced to the arrival of these families. After leaving Anderson in 1882, records reflect Father Orzechowski&apos;s presence in various parishes in the northern states until around 1894. He returned to Poland where he expressed his feelings about freedom. He was placed on trial and sentenced to Siberia where he died after a short time in prison. Recorded in the Catholic Archives in Austin, Anderson was also attended by Father Joseph Mosiewicz. After his ordination in 1875 by Bishop Dubuis, he served in several parishes including Marlin, Bremond, and Anderson. He died in 1883 in Bryan as a result of a Church fire. Father Polanski arrived in 1883 from New York City. He remained in Anderson less than a year. Parish history cannot be traced from 1883 to 1887, as there are no recorded church records. Visiting priests serving Anderson during this period carried the sacramental records with them to their parishes. (Bryan, New Waverly, Marlin and Bremond). One such visiting priest was Father Adam Laski. He served Anderson while stationed in New Waverly and Bryan. In 1888 Father Laski became the first resident priest. He remained until 1890, at which time he returned to his Poland where he died a martyr. Father J. Chalcarz arrived in 1890 and was appointed as the second resident priest at St. Stanislaus. He came to Anderson from Poland, returning there in 1892. The parish was blessed with another priest from Poland in the person of Father A. Sulek. He arrived at St. Stanislaus in 1893 and was appointed as the third resident priest. He served until 1895 at which time he returned to his native Poland. Father J. Klein of St. Mary&apos;s Church in Plantersville offered Mass at St. Stanislaus from 1895 to 1897. During that same year Father F. X. Pruss took charge of the growing parish. He built a 40x60 ft. church and the old school building was converted into a small school which closed after Father Pruess&apos; departure in 1903. It was during this period that the Rosary Society was organized. Years later it would become known as the Altar Society. Father Peter Litwora was appointed pastor of St. Stanislaus in 1904. For the first four years (1904-1908) he continued to help out at times in Bremond. Events of the next four years (1908-1912) are very sketchy, as Father was very ill. His tenure as pastor was blessed with many good works. However, because of poor health, he was compelled to leave Anderson. It is speculated that the carried the sacramental records in a saddlebag as he traveled from one place to another. Tracing records during his tenure at any Church is very difficult however a few have been found. In his absence, Father C. H. Weizenerowski attended once or twice a month, traveling from Brenham. There was not a resident priest for almost a year. On many occasions the parishioners traveled to Brenham in hack to bring Father for Mass. He was also sent for in case of illness or death. Father Weiznerowski served until Father Marcus Dombrowski was appointed pastor in 1912. His tenure was noted for the digging of a deep water well he had felt was needed as a source of good drinking water. He also attempted to remodel the old frame church. In 1916 Father N. T. Domanski became pastor. He was ordained in 1914 and came to Anderson after serving in Chappel Hill. Noting the old church was too small for the parish family and in great need of repair, he proposed the erection of a new church in 1916. The old frame church was moved with a team of mules to make way for the construction of the new church. The faithful attended Mass in the old church until the new one was dedicate. The beautiful stained-glass windows were designed and made by European artisans and are indeed masterpieces in their own right. The gorgeous altars are exquisite and unique in design. The majestic wooden spires which grace the beautiful altars ascend to Heaven as in an act of adoration. The ornate and elegant handiwork is marked by flawless craftsmanship. These lovely altars inspire us in our liturgical worship and in our praise to God. They are the focal point of interest for many visitors who come and absorb the beauty of our church. Father&apos;s dream of a school for the youth in his care never became a reality. However, the dedication of a magnificent structure we enjoyed to this day was a bright shining star in his tenure as pastor of St. Stanislaus. The new church was completed in 1917 at a cost of forty thousand dollars. In less than two years, his dream of a beautiful church was realized and the joyful day of dedication on August 6, 1918 by Monsignor James Kirwin was a historic occasion as well as a day of spiritual joy for the proud parishioners. Progress continued within the parish and under his direction, more property was acquired in 1918. In 1924, the rectory was enlarged and in 1939 the parish hall was built. Father Domanski actively served the parish until 1931. When Father could no longer fulfill his duties as pastor, Father T. W. Kappe came to St. Stanislaus. Father Domanski passed away in 1955 at which time Father Kappe became pastor and served until 1960. Many accomplishments marked his tenure. In June of 1955 the local Council of the Knights of Columbus was organized and named in memory of Father Domanski. The parish celebrated its first homecoming in August of the same year. In 1956 the church underwent some much-needed renovation. He encouraged participation in the Cursillo Movement and he served as director of the Rural Life Conference for the Diocese. The love, zeal, and enthusiasm he expressed for his flock at St. Stanislaus serve as a loving tribute to his memory. Father was greatly loved and revered by all whose lives he touched. Everyone who had the privilege of knowing and loving Father Kappe will recall his time in our parish as a truly blessed and joyous period of our history. He organized the first C.Y.O. He arranged for seminarians to spend summers in the parish, conducting religious education classes. He served as an adult leader for the local Boy Scouts. His memory lives on as our young people can grow spiritually at Camp Kappe, the first and only diocesan youth camp, named in honor of Father Kappe, located a short distance from Stoneham, where Father was laid to rest in the church cemetery there in January 1976. In 1960 Father Klass served as pastor. Father William Kennelly served for a brief time in 1961. He was succeeded by Father Robert Gradel who served until 1964. In that same year, Father Kappe returned as pastor for two years. In 1966 Father Bernard O’Neill arrived to become pastor, a position he held until his death in June 1979. During his tenure, the parish acquired an additional 10 acres of land and restoration of the church continued, the old wood frame rectory was dismantled and a beautiful much needed rectory was dedicated. The Holy Name Society was organized in 1967. Father Louis S. Sikorski arrived in Anderson on July 14, 1979 and assumed the duties of pastor St. Stanislaus. That summer, with the aid of parishioners, the old brick rectory was renovated and converted into classrooms, so that the C.C.E. classes could be moved from the local public school back to the parish. Beginning in 1979 with the help of some very dedicated parishioners, the Bazaar facilities and its attractions began to be expanded, and presently, it draws one of the largest crowds of any event in Grimes County. Because of the financial success of the annual Bazaars, the remaining debt of thirty-two thousand dollars on the new rectory was paid off in 1981, and over one hundred and twenty thousand dollars in parish improvements have been made on the church and the other parish buildings. Some of the improvements include the construction of new Bazaar buildings, two concrete parking lots, outdoor lighting, repair and sealing of the stained glass windows in the church and in 1989, the installation of a state-of-the-art sound system in the church. Over the past ten years, the Holy Name and Altar Societies have expanded their programs and goals, becoming models of active parish participation and assistance to the pastor and the parish. The C.C.E. program has grown and is staffed by some very dedicated teachers from the parish. The C.Y.O. has distinguished itself by their participation in parish functions and by winning a number of first place awards in athletic competition. The parish is also proud to have two permanent deacons ordained from the parish in 1984. Both have served the parish well. Father John Prill served the flock of St. Stanislaus from September, 1984 until October 1, 1985. Father was born in Poland as were many of the priests who have served the parish of St. Stanislaus in the early years of its history. Father Sikorksi resumed his duties as pastor in October of 1985. In June of 1989, the parish celebrated the joyous occasion of Father’s 25th anniversary of Ordination. Father’s tenure here has been blessed with many accomplishments appreciated by all who visit our parish. His love of St Stanislaus is contagious and is reflected in his ardent desire to preserve the Church in all its pristine beauty and serve his flock with untiring zeal. Father’s pride and interest in our parish family motivate us all with a deep love for the heritage which is ours. His great concern for the youth is evident in his constant support. The beautification of the church grounds under Father’s direction; include the planting of flowers, shrubs and trees, and the constant upkeep of the parish cemetery, thereby enhancing the appearance of our beautiful church. Father Sikorski retired on October 16, 2007. May God continue to bless Father and his endeavors as we recall all the dedicated priests and our loved ones who are now enjoying the fruits of their faith and perseverance. As we enter into a new decade, may our hearts be filled with the same strong faith and love which characterized our ancestors who have gone before us. After Father Sikorski retired, Father Raul Marterior, pastor of Christ our Light parish in Navasota, took on the responsibility or pastor for the parish of St. Stanislaus in Anderson. He did an outstanding job of improving the parish at St. Stanislaus. He had a fence erected around the cemetery and put in a new playground for the children. He had the original Stations of the Cross restored as well as the Altars. The organ was moved back to the loft and a choir was added. The baptismal font was moved to the entrance of the church. A new parish hall was built in 2010 at a cost of 1 Million Dollars and there is plans to have the original ceiling painting restored in the sacristy. Our current pastor is Father Eli Lopez. He is currently both pastor for Christ our Light in Navasota and St. Stanislaus in Anderson.